That voice you just heard in an Alien Group Voice Box II connected to an Atari 800. Voice Box was a external speech synthesizer box for the Atari 400 and 800. 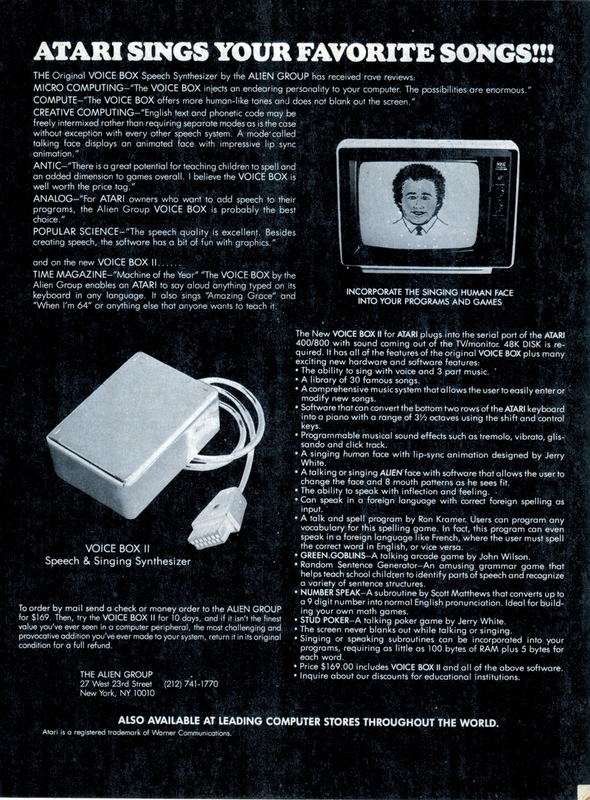 Voice Box, and its successor Voice Box II, was marketed by "The Alien Group" starting in July 1982. The device used the Votrax SC-01A speech synthesizer chip to add speech and singing to the Atari. Versions were also available for the Commodore 64 and Apple II computers. The Alien Group was actually an offshoot of Electro-Harmonix. Electro-Harmonix was founded by rhythm and blues keyboard player Mike Matthews in 1968. The company is still is business today, and is well-regarded for its guitar pedals and other musicians' gear. For more background on The Alien Group and Voice Box, I recommend reading Bill Lange's blog post "Atari Says Its First Word." This interview with Mike Matthews took place on November 13, 2017. "My first big software project was for my dad, when I was about 13. What I wrote was an Atari BASIC function that would take a number as input, and would output the phonetic equivalent of that number. The idea was that other people -- who wanted to write applications that would speak a number -- could use the function to convert application-generated numbers to a speakable string." Scott also doesn't remember who, if anyone, won the $5000 contest for best talking software.